A budding crown of buds. 1. Bring 4 cups of water to a boil. Put in the walnuts and let them boil rapidly for 3 minutes. Drain. 2. Combine the olive oil, lemon juice, salt, and stock in a blender. Crumble the wanuts and add them as well. Blend, pushing down with a rubber spatula when needed until you have a smooth paste. 3. Put the drained broccoli in a serving dish. Pour the sauce over the top and toss gently. Serve immediately. 1. Cut the broccoli head into slim 1/12-inch lengths. Peel the larger stems ad cut them crosswise into 1/8-ninch slices. 2. Put the oil in a large wok or frying pan and set over high heat. When hot, put in the ginger. Stir once and put in the broccoli, salt, and garlic. 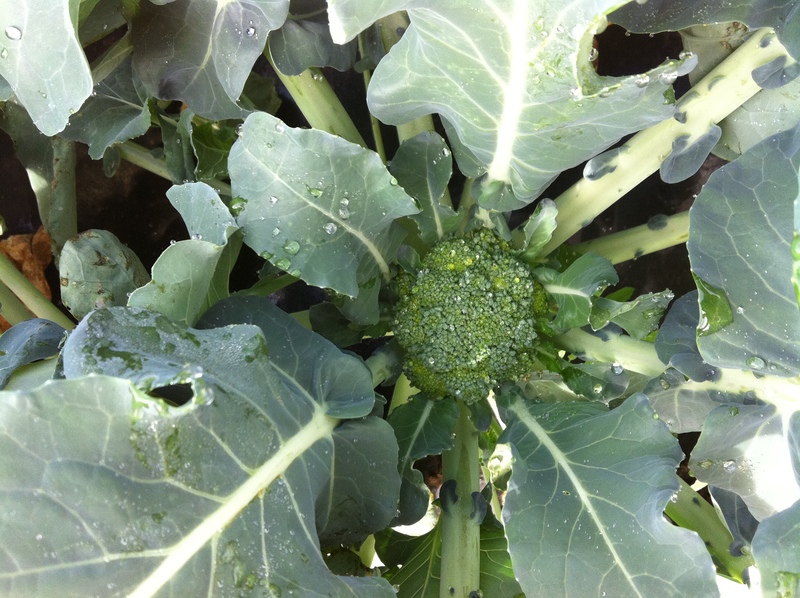 Stir vigorously for a minute, or until the broccoli turns bright green. Add the stock, cover, and cook on high heat for about 1 1/2 minutes. Turn off the heat. Add the sesame oil and stir to mix. Serve immediately. 1. Blanch the broccoli florets in salted water. Drain and if not cooking immediately, refresh under cld water. Leave in a colander. 2. Peel the potato anad cut into chunky dice, the same size as the broccoli florets. 3. Just before eating, put the oil in a large, preferably nonstick frying pan or sauté pan and set over medium-high heat. When hot, put in the asafetida and, a second later, the mustard seeds. As soon as the mustard seeds begin to pop, a matter of seconds, put in the green chile and the curry leaves. Stir once and put in the potatoes. Stir and fry for about 4 minutes, or until the potatoes are very lightly browned. Sprinkle them with a scant 1/2 tsp. salt. Toss to mix. 4. Now put in the broccoli and amchar masala. Turn the heat to medium and stir for 1 to 2 minutes, until the broccoli has heated through. Turn off the heat and serve. 1. Separate the florets from the stalk; break into smaller florets. Cut the stalk into 1-inch lengths and then into matchstick-size strips. 2. Place the broccoli in a steamer basket set over 1 1/2 inches boiling water and cover. Steam for 5 minutes. Transfer the broccoli to a bowl. 3. Combine the remaining ingredients in a small bowl; stir until well combined. Pour the dressing over the broccoli and mix well. 1. Preheat the oven to 375°. Lightly coat a baking sheet with olive oil. 2. Melt the butter in a large skillet over medium-high heat. Add the onion; sauté for 5 minutes. Add broccoli, 1/2 tsp. salt, and 1/2 tsp. pepper; cook, stirring, for 5 minutes. Add the garlic and cook until the broccoli is just tender, 2 to 3 minutes. Remove from heat. 3. Stir in the feta, bread crumbs, olives, and lemon juice. Add salt and pepper to taste. 4. Lay a single sheet of phyllo dough on a clean, dry counter or large cutting board. Lightly brush the top side only wtih oil or melted butter, then top wtih another sheet and brush wtih oil or butter. Continue this process until you have 5 sheets layered on top of one another (do not butter or oil the top layer at this point). Repeat this procedure with the remaining 5 sheets of phyllo to make a second stack. 5. Working with the first stack of 5 phyllo sheets, place half the filling at one short end of the dough, leaving about a 1-inch border of dough. Fold in the sides and gently roll the pastry to make a log. Carefully transfer the pastry to the oiled baking sheet. Brush the top of the log with more oil or melted butter. Repeat this procedure to make a second roll with the remaining phyllo stack and filling and place it on the pan. 6. Bake until pastry is golden and crisp, 25 to 30 minutes. Cut with a serrated knife and serve hot or at room temperature.